Scripture does not record one word from Saint Joseph. Silence is poignant and powerful. Maybe you have a special devotion to the patron of the universal church and the man closest to Christ. My prayers and those of my parents were answered when God sent me the man of my dreams through the intercession of Saint Joseph. Nearly twenty four years later in the Sacramental vocation of Marriage, I know with certitude that God formed the textbook husband and father for our two most amazing children. Today, I walked into daily Mass praising God for the humble model for all fathers. 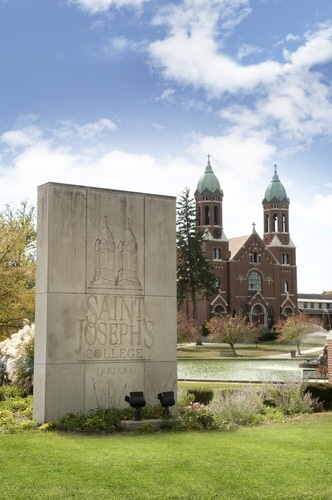 In gratitude, I adorned our alma mater Saint Joseph’s College, the place where our family roots began. Remember, O most chaste spouse of the Virgin Mary, that never was it known that any who implored your help and sought your intercession were left unassisted. Full of confidence in your power, I fly unto you, and beg your protection. despise not, O foster-father of the Redeemer, my humble supplication but in your bounty hear and answer me. Amen.